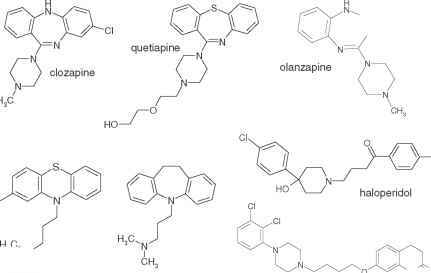 Chlorpromazine was the first compound identified to have therapeutic benefit for schizophrenia, and surprisingly it emerged from the field of antihistamine research.74 It has high affinity for adrenergic a-1A, -1B, -2B, and -2C, histamine H1, dopamine D2, D3, and D4, serotonin 5HT6 and 5HT7, and muscarinic M1, M3, and M5 receptors.75 It has strong sedative properties and was quickly superseded by drugs such as haloperidol and clozapine that maintained broad receptor interaction profiles and lower frequencies of adverse motor and cardiovascular effects. Compound structures are shown in Figure 7.2. FIGURE 7.2 Selected structures of psychiatric drugs. Atypical antipsychotics include clozapine and its close analogs, quetiapine and olanzapine, plus the D2 partial agonist, aripiprazole. Haloperidol and chlorpromazine are typical antipsychotics, also known as neuroleptics. Imipramine, a derivative of chlorpromazine, is an antidepressant. FIGURE 7.3 Dopaminergic pathways in a sagittal section of brain. 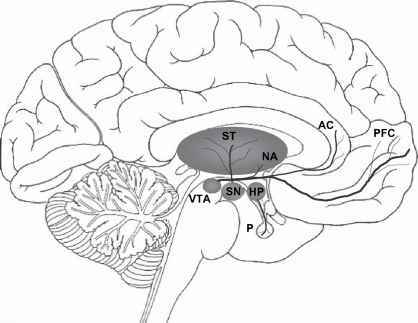 The nigrostriatal pathway containing about 75% of the DA in the brain originates in the substantia nigra (SN) and projects primarily to the basal ganglia or striatum (ST), the center of movement control. 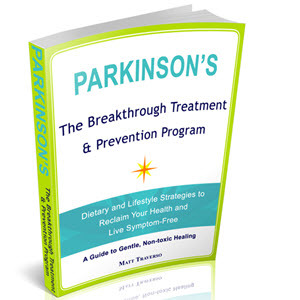 This pathway is implicated in Parkinson's disease and in the extrapyramidal (short term) and tardive dyskinesia (long term) side effects observed during antipsychotic therapy. The mesolimbic pathway originates in the ventral tegmental area (VTA) and projects to the medial components of the limbic system such as the nucleus accumbens (NA) and anterior cingulated (AC) cortex. This pathway is implicated in emotion, memory, and the positive symptoms of schizophrenia. Neurons in the mesocortical pathway also originate in the VTA and project primarily to the PFC. This pathway is implicated in motivation and planning, attention, social behavior, and the negative symptoms of schizophrenia. The tuberoinfundibular pathway originates in the hypothalamus and projects to the pituitary gland where DA release controls prolactin secretion, influencing lactation and fertility. The existence of multiple dopaminergic systems in the brain is key to understanding the pathology and current treatment strategies for schizophrenia (Figure 7.3). The dopamine hypothesis of schizophrenia, first proposed in 1965,84 now proposes that excess dopamine observed in the striatum leads to positive symptoms and a dopamine deficiency in prefrontal cortex contributes to negative symptoms. Whereas D2 receptor blockade in the mesolimbic pathway is believed to account for efficacy against positive symptoms, D2 blockade in the nigrostriatal pathway results in acute dyskinesia, akinesia, and tardive dyskinesia, motor side effects collectively referred to as EPS. Atypical antipsychotics selectively block dopamine receptors in limbic brain areas, consistent with their lower side-effect profiles. One clinical trial with the SR141716A CB1 antagonist has been reported, but it did not demonstrate significant improvement in positive or negative symptoms of schizophrenia.90 The adenosine A2a receptor is also of interest based on the activity of CGS21680 in Cebus paella monkeys.98 Specifically, A2a-D2 heterodimers localized in the dendritic spines of the striatopallidal GABAergic neurons have been implicated as potential targets for schizophrenia and other disorders.99 Research related to finding novel antipsychotic drugs includes efforts aimed at GPCRs, ion channels, neurotrophic factors, and even cell-signaling mechanisms100 that may achieve better efficacy against positive and negative symptoms and therapeutic benefit for cognitive deficits such as reduced ability to focus attention and deficiencies in executive function. Preclinical models have implicated serotonin 5HT2A,101 5HT6,102 dopamine Dl103 and D2,104 and adrenergic a-2A105 receptors as targets to enhance cognitive function.